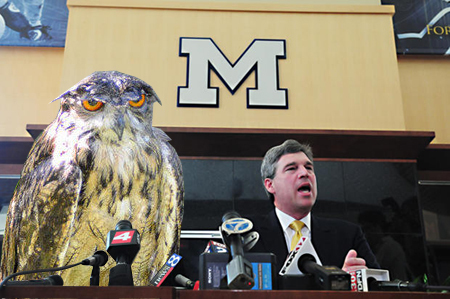 I was waiting for the right time to release this information, but I have three sources on good standing that all say Wet Owl will be announced on Monday as Michigan's next head coach. They each mentioned that Dave Brandon is impressed with his resistance to being mercilessly sprayed with a hose, something that the previous regime was used to. Brandon also cited his "ability to fly" as a key attribute. Wet Owl doesn't bring much experience but he does bring a keen mind and the tools necessary to catch field mice. He's a questionable hire, but depending on who he brings in as defensive coordinator, he may be able to turn the program in the right direction. Perhaps most importantly, he's faster (when wet) than Denard Robinson, something that has reportedly impressed the talented sophomore and may keep him on Michigan's campus.